The Cathedral of the Holy Wisdom of God in Harbin, China. Built in 1907 and expanded from 1923-32, it was closed during the Great Leap Forward and Cultural Revolution period, and recently turned into a museum in 1997. The ornate Christ the Savior Cathedral in Borki (Kharkiv Oblast province, Ukraine), ca. 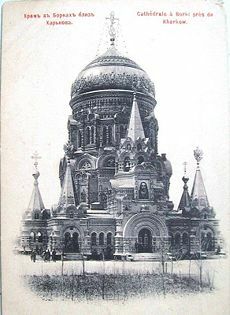 1900, was the inspiration for the St. Sophia Cathedral in Harbin. Fr. Fotiy Huo Desheng was the ninth rector of St. Sophia Church of Harbin. (Chinese: 聖索菲亜教堂, Russian: Софийский собор в Харбине) is a former Russian Orthodox church located in the central district of Daoli, Harbin City, Heilongjiang Province, China. 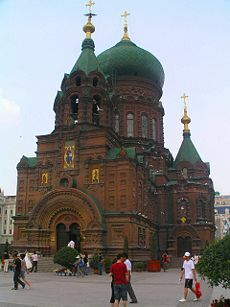 St. Sophia Orthodox Cathedral is one of the most magnificent structures in Harbin. It was built in 1907 after the completion of the Trans-Siberian Railway in 1903, which connected Vladivostok to northeast China. The Russian No.4 Army Division arrived in this region just after Russia's loss to the Japanese in the Russo-Japanese War (1904-1905). St. Sophia Church was built and completed of timber in March, 1907 as part of a plan to reconsolidate the confidence of the army by building an imposing spiritual symbol. In 1921, Harbin had a population of 300,000, including 100,000 Russians. The church was expanded and renovated from September 23rd 1923, when a ceremony was held to celebrate the laying of the corner stone, to its completion on November 25th, 1932, after nine years. The present day St. Sophia Church was hailed as a monumental work of art and the largest Orthodox church in the far east. According to Harbin municipal religious and Daoli district archives, Fr. 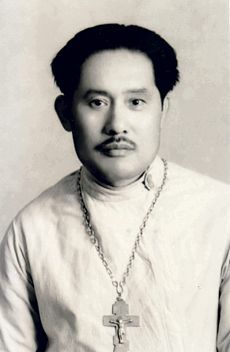 Fotiy Huo Desheng was the ninth rector of St. Sophia Church of Harbin. The church is located on the corner of Toulin Street (Toulin jie) and Zhaolin Street (Zhaolin jie). It stands at 53.3 meters (175 feet) tall, occupies an area of 721 square meters (0.18 acres), and is the perfect example of Neo-Byzantine architecture. The main structure is laid out like a cross with the main hall topped with a huge green tipped dome. Under the bright sun, the church and the square area it lies on looks quite like the Red Square in Moscow. Following the establishment of the People's Republic of China (PRC) in mainland China in 1949 by the victorious Communists, who ended all Chrisitan missionary work, treaties were signed between the Soviet and Chinese governments that provided for the turning over of Russian churches to Chinese control. The cathedral was thus closed from the period of the Great Leap Forward (1958-61) and Cultural Revolution (1966-76). Although the cathedral's sturdy structure withstood its intended destruction during the Cultural Revolution, its empty hull became a warehouse for a nearby state-run department store, its windows were bricked up and saplings grew from the roof. Prefabricated concrete high-rises boxed the church in on all four sides, coming within yards of its walls, making the cathedral inaccessible and invisible from the street. For decades it remained the invisible center of the city, surrounded by decorative material stalls, an auto body shop, a pen factory, and apartments for city government employees, until the Beijing government designated the cathedral a national cultural heritage site in 1996 as part of a nationwide campaign to protect historical sites. Following its designation in 1996 as a national cultural heritage site (First class Preserved Building), a newspaper article about the "hidden" cathedral prompted donations from locals to restore the church. Local corporations, individual businesses as well as workers from nearby department stores donated money to restore the cathedral and renovate the square. A total of 12,000,000 yuan (approximately $1.5 million US) was eventually gathered and the cathedral regained its visibility in 1997, as the surrounding buildings were torn down. A new "Harbin Architecture Square" conspicuously highlighted the cathedral with a huge new fountain at its entrance. The European-looking space was assigned a new meaning as the embodiment of culture and art and was re-presented to the public as the proud heritage of the city. "The restoration of St. Sophia Cathedral inspired the people of Harbin, raised the level of our culture, let the whole of China and foreign friends know China, and opened a way for faster economic development." The restoration was the culmination of the Harbin municipal goverment's attempt to turn the city's colonial era structures into tourist attractions by restoring and granting them landmark status. The restored structures are said to signify civilization (wenming) and culture (wenhua). ↑ 2.0 2.1 Yukiko Koga. "The Atmosphere of a Foreign Country": Harbin's Architectural Inheritance. In: Anne M. Cronin, Kevin Hetherington. Consuming the Entrepreneurial City: Image, Memory, Spectacle. Routledge, 2008. p.229. ↑ "PRESERVED BUILDINGS." Harbin Urban and Rural Planning Bureau. ↑ Yukiko Koga. "The Atmosphere of a Foreign Country": Harbin's Architectural Inheritance. In: Anne M. Cronin, Kevin Hetherington. Consuming the Entrepreneurial City: Image, Memory, Spectacle. Routledge, 2008. p.221. David Wolff. To the Harbin Station: The Liberal Alternative in Russian Manchuria, 1898-1914. Stanford University Press, 1999. Yukiko Koga. "The Atmosphere of a Foreign Country": Harbin's Architectural Inheritance. In: Anne M. Cronin, Kevin Hetherington. Consuming the Entrepreneurial City: Image, Memory, Spectacle. Routledge, 2008. Saint-Sophia Church. Government of Harbin website. "PRESERVED BUILDINGS." Harbin Urban and Rural Planning Bureau. "St. Sophia Church." China Spring Tour. St Sophia Church of Harbin at Orthodox.cn. Nutescu Ciprian. St. Sophia Church,Harbin,China. Google 3D Warehouse. June 2, 2008. (Three-dimensional 360 degree view). This page was last edited on October 22, 2012, at 01:00.